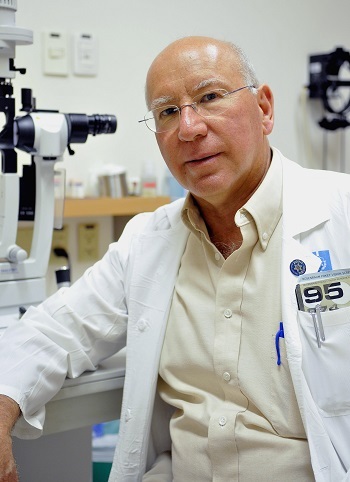 Prof. Yaacov Pe’er, Immediate Past Director of the Hadassah Medical Organization’s Ophthalmology Department, has been honored with the American Academy of Ophthalmology (AAO)’s annual prize for his contributions to the field of ophthalmology and the prevention of blindness around the world. Next year, the ophthalmology department will celebrate 100 years of operation. Prof. Pe’er served as its Director for over 20 years and now serves as Senior Physician in the Department. The AAO, the world’s largest association of eye physicians and surgeons, brings together more than 30,000 ophthalmologists from around the world for its annual conference during which Prof. Pe’er will be awarded the prize. In its announcement of Prof. Pe’er’s selection, the AAO stated that Prof. Pe’er receives the award because of his significant and worldwide contribution to the prevention of blindness and to vision rehabilitation in the world, as well as his outstanding personal commitment to humankind and his inspiration to other physicians around the world. “I receive this award with great pride, also in the name of the wonderful Department of Ophthalmology at Hadassah, which, in parallel with the clinical and academic work that has placed it at the forefront of ophthalmology, has been working in this field in developing countries since 1959,” says Prof. Pe’er. Prof. Pe’er, himself, established an ophthalmology department at a hospital in Kenya in the 1980s. In addition to its extensive activity in training generations of physicians, and in providing advanced and, at times, breakthrough treatment in Israel in the field of ophthalmology, the Hadassah Ophthalmology Department has offered a Certificate studies program to doctors from developing countries since 1961. To date, doctors from 38 countries have been trained as part of Hadassah’s unique program, which in the past two decades has been under the leadership of Prof. Pe’er. The activity was part of the ongoing work of the Hadassah Department of Ophthalmology and of Professor Pe’er in the ICO–the International Ophthalmology Association, where Prof. Pe’er served as head of the Committee for Countries with a Minimal Presence of Ophthalmologists. The goal was to raise awareness of the need to build advanced medical eye services in these countries.